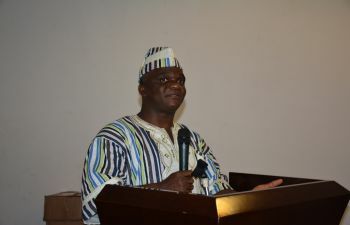 The head of Liberia’s premier regulator of public procurement, James Dorbor Jallah, says he is heartbeat with the current trends in the public procurement professionalization initiative launched in 2015 by Public Procurement and Concessions Commission(PPCC), in partnership with United Nations Development Program(UNDP), to address the huge capacity deficit in the field of public procurement and prepare Liberia’s public sector procurement staffs to qualify for certificate awards in purchasing and supply from the UK based Chartered Institute of Purchasing & Supply (CIPS). Mr. Jallah made the assertions on Monday, November 20, 2017 in the conference facility of Hotel Buchanan in Grand Bassa County, during the opening session of CIPS Level 4 (back-to-back) procurement professional certification training sessions for 60 procurement staff of Government ministries and agencies, as well as partner institutions that completed requirements for CIPS level 2 introductory and CIPS level 3 intermediate courses in public procurement. He expressed confidence in the ability of the facilitator to deliver quality lectures as well as ability of participants to comprehend and make success. The first session comprises 30 participants and runs from November 20-24, 2017, while the second session contains similar number of participants and it runs from November 27-December 1, 2017. The participants are drawn from several public sector institutions and international organizations including Liberia Institute of Public Administration(LIPA), Public Procurement and Concessions Commission(PPCC), National Port Authority(NPA), General Auditing Commission(GAC), UNDP, and county-based institutions. CIPS Level 4 is the final stage in the category of levels 2,3&4 as approved by the Chartered Institute of Purchasing and Supply (CIPS) based in the United Kingdom. Candidates are required to complete five days of intensive classroom work and at least six weeks of Work Based Assessment (WBA) to qualify for awards in Purchasing and Supply. Like Mr. Jallah, the Country Director of UNDP, Pa Lamin Beyei, said Liberia is on the verge of making significant advances in the professionalization efforts of public procurement evident by the success level of the program since its inception in 2015. He averred that UNDP will continue its collaboration efforts with PPCC to strengthen the capacity of procurement personnel so as to improve performance and reduce waste and abuse in public procurement. “I can proudly say that Liberia’s public procurement sector has improved significantly and will even do better if the current trend of innovations is upheld”, he added. The director of Regional and Sectorial Planning of Ministry of Finance and Development Planning, Mr. Sidikie Quisie, also spoke at the opening session and made similar assertions. Mr. Quisie said the level of improvement in the public procurement sector is credited to the farsightedness of PPCC leadership and its demonstrated ability to uphold the rules and legal framework governing public procurement in Liberia. Director Quisie assured his ministry’s commitment to working closely with PPCC to achieve its monitoring and regulatory mandate, as well as capacity building mandate area. He thanked UNDP for supporting the procurement capacity strengthening efforts launched by PPCC few years ago to professionalize public procurement in Liberia.